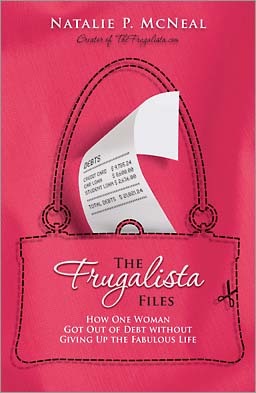 Today is day three of Giveaway Week, and today’s book up for offer is Natalie McNeal’s The Frugalista Files: How One Woman Got Out of Debt Without Giving Up the Fabulous Life. Now, I actually bought this fantastic book as a birthday present to myself, as I have a big time Compact (buy nothing new) exception for books written by friends, and although we’ve not met in person, I consider Natalie to be a friend. However, it’s not just my connection with Natalie that made me like this book. I really enjoyed the diary format and reading about the author’s year long transformation from spender to saver. I carried this book with me everywhere and devoured it in under 24 hours. So great, loved it! Highly recommend. The enter to win this book, write something in the comments section about your favorite money saving tip. I will randomly choose a winner next Sunday, March 27 at 9:00 P.M., west coast time. Click HERE to enter Monday’s giveaway of Annie Leonard’s The Story of Stuff. Click HERE to enter Tuesday’s giveaway of Dave Wann’s The New Normal: An Agenda for Responsible Living. Tracking my spending. Just knowing where my money goes keeps me accountable and I spend less. Thanks for the week of give-a-ways! The pantry principle for food. Stock up on items when they are at their best price than make meals based on what you have. Using what I have and shopping my cupboards before shopping the stores. Making new greeting cards from old….I recycle cards sent to me, pictures from magazines, or photos by cutting out the image I want and gluing it to a folded piece of paper. I found a stack of card size envelopes at my local thrift store, so now I am all set for any occasion. DO sweat the small stuff – straight from Amy Dacyczyn. There are only a few ways to save large sums of money, but there are thousands of ways to save a few cents. And didn’t she prove it. I stay out of the stores (including online stores) as much as possible. If you aren’t shopping, you can’t buy anything. I will save thousands of dollars by refinancing our mortgage. Borrow and share instead of buying when you need something! This works especially well for things you don’t use often – special occasion jewelry/accessories, 5 pie plates all at one time for a party, extra chairs/tables for a party, etc, etc. I remind myself that home is the cheapest place to be. It’s hard to move about the city without spending money! I have just started couponing for groceries, and I’m working on stocking up on basics when they are BOGO free and with coupons, things like pasta, canned foods. Not hoarding, just keeping enough until next sale. I really want to read this book!! My next saving attempt is getting rid of paper products like napkins, papertowels, paper plates!! Would love to win this book. Its something that I need to be doing…. One of my favorite money saving tips is making my own coffee. I’ve always wanted to read this book! If I don’t win it here, I’m going to get it from the library….assuming the library carries it, which leads me to my favorite money saving tip. Use the library. My family and I are weekly visitors to the library. I just waited 6 weeks to check out a copy of Poser; it was well worth the wait too! When figuring out my budget for the week, I always sneak an extra $10 from my spending money section to my savings section. I usually don’t notice it’s gone, and it’s an easy way to boost my savings each week. Using paperback swap to get some of the books I want to read off my list and getting rid of the ones I no longer need. Limit spending to one day a week. It helps control impulse purchases. I love using my community library for books and dvds. I rarelygo to the movie theater anymore. I love to live in the dark. And by that I mean I follow all 5 people in my family around the house turning lights off after them! Grouping my errands together so I don’t waste gas. And with the price of gas (especially in NYS) it’s the way to go. Don’t go to place where things can be bought. Going to the library every week instead of the bookstore. I am trying to eliminate all paper products from my house. I use unpaper towels in the kitchen, cloth napkins, some family cloth, mama cloth, cloth diapers and wipes for my daughter. It second nature to me…..I hated spended money on paper products that ultimately were just being thrown away. I felt like I was throwing money out the window. Plus, I don’t have to run to the store for paper towels or disposable diapers which is so nice. I just throw everything in the wash! I just started tracking our spending at the grocery store and dining out and it’s helping a lot! I find that I actually think before making a purchase now. What a concept! I also depend on our local library for most of my reading materials, and this book (Frugalista Files) is not in their catalog. Ack! Must win free copy! How can my library, which I believe is also the library branch of choice for The Nonconsumer Advocate, not have this book on the shelf? Don’t be afraid to buy used clothing! You can get spectacular deals on good labels, and nobody knows but you that you got it at Goodwill. Eat at home. The minute we go out to eat, it costs us more than a full weeks worth of groceries. We are taking a vacation in April. I decided on renting a condo because I can make food and save a bunch of money while also having a good time on vacation. We will go out to eat but with a condo we will not need to go out every day for 3 meals each day. My money saving tip is to stay out of stores. Dont even go in for a look and then you wont have the temptation to pick up something at a great price. Prepare your food at home! Cook and bake from scratch when possible. We are a busy family with two toddlers and two working parents, but we squeeze in time to make supper every night (even a simple meal of eggs and toast or sandwiches), pack lunches for work, make yoghurt, and bake bread, muffins, cookies, etc, on the weekends. We are a family of 5 and have just one vehicle. I stay home with my young children and my husband bikes to work daily. Having one vehicle saves us tons of money. I gave up expensive haircuts – instead of paying up to $50 for a haircut and tip, I go to an inexpensive chain, pay about $13, give a generous tip to a really appreciative worker, and still save money! And I honestly can’t see the difference in the haircuts. I also wash my hair every other day, and just rinse and dry on the “off” days. My hair looks and feels exactly the same. My money saving tip is to pack a lunch and/or snacks for work. I try to cook extra on the weekends so that I have an assortment of leftovers to chose from during the week. My favourite money-saving tip is to know what your money is doing. It’s sneaky stuff, is money, and sure to be doing something like buying takeout for lunch or an extra coffee in the afternoon when you’re not looking. We set a timer to turn our heat off from midnight to 5 a.m. and during the day if no one is going to be home. We save hundreds of dollars over the course of a winter without ever being uncomfortable. Bring your lunch! For me, to buy lunch at work runs about $10/day, so I save $50/week by bringing my lunch from home, plus I get to control quality of ingredients and make sure I’m eating healthy! My favorite money saving tip? Cook from scratch, shop at Aldi’s, don’t eat out. Oh, and reduce and reuse. Reduce the amount of “stuff” you have and reuse as many things as many times as possible. Best money saving tip- stay out of the stores! i try to only buy what we really need and forgo the rest. Wow, hard to add a new tip. We are really focused on not wasting food buy planning before shopping and eating those leftovers. Not money saving, but the best motivator I have for saving money is so that we can be generous in helping family members and donating to our selected charities. Buy foods in whole form and prepare them yourself. Wash and chop your own veggies, cook dried beans in the crockpot and freeze what you don’t use right away. I listen to audio books that I check out at the library while doing kitchen tasks. It makes me look forward to kitchen work. Eating at home and taking lunch. Saves crazy lots of money…and calories. Make ahead breakfast, lunch and dinners. My favorite- homemade “fastfood” burritos. Still fast but healthy! I like to have friends over for dinner instead of going out. Everyone brings a dish, and we get to socialize without spending a ton of money on restaurant food. I use the library for books/CD’s/Movies. Our library lets you request what you want, which makes it so easy! You get an email when it’s ready to be picked up. When I add up all the money I used to spend at Barnes and Noble…Oh my! I make my own skin and hair care products from natural ingredients. I once calculated the savings: I now spend about $100 a year on ingredients, when formerly I spent close to $500 a year on commercial products. I travel for work and I work hard to bring food for most of my meals with me (usually 3 overnights at a time). It saves money since the food I bring is a lot cheaper than restaurant food and I get to apply those savings of my per diem to paying off credit card debt. Would love to read this book! I entertain myself with Netflix and knitting. I can’t pick just one, so I’ve narrowed it down to two favorite ways to save money. I find that I waste money in two areas primarily: food waste (since it’s just my husband and myself, I find it hard to use recipes for two) and wasted money on impulse buys. 1.) Make a soup/stew! Throw in any food that is getting ready to go bad! Simmer past-prime veggies in a little olive oil, use a couple of old chicken parts for stock, and just throw in whatever else you find. It can be quite easy to make a tasty stew or soup with scraps from the kitchen! 2.) If I see something I want really badly, I don’t buy it. I write it down and think about it for a month. I revisit later, and most of the time realize I don’t even want it anymore. It curbs my impulse buying because it cuts the impulse out all together! Thanks for the giveaway week, I love your blog so much and am adapting the way I live based on your fun and helpful life stories! 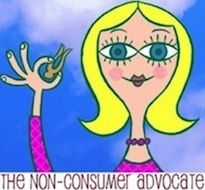 Money saving tip: Read The Non-consumer Advocate and learn!!! I love shopping at Goodwill – great finds (occasionally) and money going to a good cause (always). My shopping tip is to ask myself at least 3 times before buying – do I really need this? Today, I was stopping by a Goodwill in another town and saw a packaged purple (I love purple!) yoga mat – just like the one I have at home. I told myself “Now I could keep one in the car and have one at home” – only that wasn’t a good enough reason to buy a 2nd mat. So back on the shelf it went and I walked out with only a $1 book. Yea!! My favorite money saving tip is to use cash whenever possible and to buy used whenever possible. Coupons and discount stores are awesome for items you can’t buy used. Generally speaking though, the best way to save money is to not buy things you don’t need! My favorite money saving tip is to make my own laundry detergent. I do a dry ingredients version with: 2 parts grated soap, 1 part borax and 1 part washing soda–mix well, us one heaping tablespoon per load. I like this b/c you don’t have to have a certain amount (other than the 2 parts/1 part) to make up a batch. God Bless!! Automate all our savings. We move money over to ING direct the day after payday and live off the rest. My favorite money saving tip is to just stay home! My best money saving tip is to not go to the store, or to yard sales, etc. Nothing saves me money like not being places where I spend it. I guess my best money-saving tip is to just not go in the store. I find if I don’t go shopping or don’t just “drop in” to see what is there, I don’t spend. I know that sounds simple, but before I was constantly just going to see what was there, or what was on sale. Now I just don’t go, and I save that money I would have spent, because I always found something I had to have. I have 2: Swagbucks and my local thrift store! I don’t know how I ever lived without either! My best money saving technique is to trade/borrow things I need for only a one time use or a few times a year. I take all of our baby clothes to a baby swap and get new ones for free. I borrow equipment that’s needed occasionally and lend things out when others need them. And anything I cant borrow I try and get used. take snacks and water in the car at ALL times. You never know when you’ll be out to long, running just one more errand etc. When the gang gets hungry and thirsty it pays to at least have some fruit and H2O in the car instead of having to eat out. Last night I became “intrigued” by an ad for the tomato planting tree thing ~ a topsy turvey tomato planting thingie on a tripod – how’s that for technical? But then I told myself that my 10 cent walgreens seeds, little pots (I save them year to year) & our 2+ acres of land is sufficient. The other appealing tidbit in the ad was that you wouldn’t get bugs ~ I don’t know about other places but in New England our bugs still know how to fly. 😉 Plus, since I already have the twine and stakes (again used year to year) tying up the plants isn’t really an issue either. My point ~ watching less tv means I spend less $$$ & am less tempted. My tip is to DIY! My husband and I recently became landlords and instead of calling the handy man out for every single fix-it, we’ll attempt to do it ourselves first. We’re not handy people by any means, but with the help of google and youtube we’ve managed to save lots of money on property maintenance. We save money by making homemade,gardening, fixing things ourselves,etc….as much as we can. Oh, I would so love this book…I’ve got it on my list to borrow from the library! Thanks Katy for your blog. I look forward to reading it every day. I especially love your stories about Goodwill shopping! I surf frugality sites when I need a break from work instead of shopping sites. That cuts my temptation and spending more than in half. my best money saving tip…..that’s a hard one because I think it’s cumulative. All the little savings add up to big savings. Turning lights off, coupons, thrift stores, swapping. But I think the thing that helps me the best is using cash. I keep cash in my car for the unexpected garage sale. I keep little stashes in my wallet for school necessities. I keep a check book with a running balance so I know exactly what there is left. That usually helps me keep things under control. The key word being usually. Would love the Frugalista, would give me inspiration and more motivation. Thanks for the offer. Put at least 10% of your income into savings. I have always done this, even when I was a student and living on <$150/week. I managed to save for a trip overseas! I think the most powerful thing you can do financially is track your spending. It becomes harder to impulse buy knowing that you will have to enter the transaction in later and that will put you over budget in a particular category. It also helps you see just how much you are spending on food for example and you can track whether your new frugal approaches are actually making a difference. Here in our SC development, our water pipes are under the cement slab. Therefore, it drives me crazy that it takes 5 minutes to get the water even warm in the shower. My tip is to turn the shower on, put my 8 qt. dutch oven pot in the shower and catch the cold water. It takes the whole 8 qts. of water to start getting warm and then I use the pot of water to water plants, indoors and out. Like others have said– cooking at home! Saves a ton of money. My best money-saving tip is to hold off on buying large items and to really really research everything. I’ve talked myself out of spending a lot of money this way. Once the “impulse” feeling wears off, I can be a lot more clear-headed about decisions. Money-saving tip? Don’t have kids! Well, of course, I wouldn’t give up my kids for anything, but they are darned expensive. A more realistic (for me, anyway) tip is to menu plan your meals in advance. I have saved a ton by doing that. I go to our bi-annual library sale and stock up! My favorite day is the last day – every book is 10 cents and there are thousands left. I always find enough to read until the next sale. Then, I donate them and make room for more. We eat meals at home and save restaurant meals for special, rare occasions. Being stuck in traffic or going to a soccer game are not special enough to justify expensive, unhealthy food. I have done it before, but we work harder now to avoid doing that. I use my small chest freezer to freeze my leftovers. That way I have ready-made meals and don’t have to eat out. Well adding this to my feeds will help. I love the internet. I was just at the store for the things on my list only when I saw the book “Happines Project”. I didn’t get it however I did come home request at the library. Although I think I am going have to break done and buy it tomorrow as all copies are on loan… okay maybe not helping my case but if I won this one it would help. I am so glad I found this blog after looking up Gretchens blog. I will say that I was at another store for a return when waiting forever in line trying to keep a smile and send love to the lady at the register. I started looking around and part of me thought I could look around for something I need. Quickly I thought no… no I really don’t need to. I think I can make do with what I have at home….And look at this website I found. This is awesome. Like I said I love the internet. Keeping up with technology savings tip: We recently sold our older digital camera on ebay for $1.00 less than we originally bought it for. The sale covered almost the entire cost of our new camera. If I need a new piece of clothing, I first go through my closet and find TWO things to get rid of/donate/swap. This way, it makes me think long and hard about the purchase in the first place and I keep my closet from getting too out of control. The hardest thing about saving money for me is not buying things when they’re affordable and I really want them, just don’t need them. Though I hate going out shopping, the Internet has made it too easy. Many’s the time I have put something into the cart, and I consider it a minor victory when I talk myself into deleting it. So, that’s it for my advice: don’t buy what’s in the cart…take a look and see if there’s anything you can borrow or live without before checking out! I get my books at Paperbackswap.com – at least the ones that I would like to own. All the rest I get from the library! My best money saving tip is to put into savings before you can even spend it! My favorite moneysaving tip is to save even the tiniest bit of leftovers. Even if there’s just a couple tablespoons of something left after dinner, I find that my preschooler and I can make use of it at lunch the next day. One tip I need to remember is not to buy something just because it’s a great deal. Who cares if it only cost $5 if you didn’t really need it to begin with! I often decide to spontaneously go shopping when I’m feeling down and need some retail therapy. However, that can put a dent in my wallet and if the reasons I’m down are more serious, retail therapy might not even help those problems. So, as often as possible, I’ll attach a little notebook to my wallet with a rubber band and a pen. Whenever I feel like I need to go shopping, I’ll try and write down my feelings first, and see if writing them down makes them go away or gives me a solution for solving them. If not, I’ll indulge in the shopping trip, but try and keep away from stores for the rest of the week. I use coupons and tips for freebies through blogs like Deal Seeking Mom and Coupon Cravings. I make sprouts for salads. I bought a special jar to do this, that cost about 8e, but it would have been easy to make one out of an old jam jar. The boxes of seeds (alfalfa is my favourite) cost about as much as two heads of lettice, and I can make about 30 salads from one box. I have fresh salads on hand all the time, plus its super healthy. I also make my own yogurt and often cook lentils and beans instead of meat. We almost never eat out, and I also pack snacks and bottles of water in my bag before heading out the door, more to control what my kids and I eat than save money, but saving money is a nice side effect! I’m always on the lookout for cool gifts that are inexpensive when I’m travelling. It’s so nice to give a friend or family member a neat birthday or Christmas gift that I got while on a trip, (and I don’t tell them that I get these gifts on clearance racks)!!! Plus, it makes them feel good to know that I thought of them while I was on vacation! I recently did away with cable TV. Now it’s Netflix all the way…and at a savings of a whopping $70 per month. Yes! My money saving idea is a ’roundabout way of making money but you have to be very disciplined about it. We have a rewards-type visa through B J’s warehouse club. All our expenses go on that credit card including our son’s college tuition! We earn BJ’s bucks — but they have an expiration date, so what I do is accumulate 3 months’ worth of BJ checks, then turn it into a BJ’s gift card which does not expire. Then I use it for gas at their gas pumps or purchases in the store. It is truly free money (and income tax free!). Last November we needed a new furnace — I charged the cost just after a billing cycle started, basically giving me free ride on the money for almost 2 months until next billing cycle’s payment was due..also earned myself a 2% discount for paying “cash” vs financing. Last year I earned $620 in BJ’s bucks BUT the key CRITICAL thing is to PAY OFF YOUR CHARGE BILL EVERY MONTH! The best overall advice is to be absolutely smart about your money and use every resource possible to get ideas that work for you! My favorite money-saving tip is to make a budget and stick with it! I must find this book if I don’t win it. Favorite money saving tip – just don’t buy anything unless you really need it. Typically if I find a frivioulis item to buy, I put it back down and wait a day/week etc to see if I am still thinking about or craving item. Then I check the pocketbook for the cash to see if I can afford to buy it. Not shopping , that’s a simple tip but the one that works best for me. If you aren’t looking at stuff, you can’t buy it! I saved a fortune when I stopped purchasing books and used the public library. We have the ability to request popular books and then wait our turn to read them. The anticipation of getting a great book is part of the fun. I havenâ€™t heard of this book before, but it sounds like an amazing read! I am quite proud that I put myself through University without borrowing one dollar. I worked the entire time through University and had all my savings automated! I didnâ€™t miss the money and I still have a chunk of my salary deposited into savings for future goals. You can actually set-up multiple savings accounts on ING so that you can really keep track of your money (i.e. a trip, school, a big purchase). I also like mint.com for tracking all of my spending and seeing where I need to cut back. Not going to the store when you really donâ€™t need anything helps too! I also wait for a good â€œGrouponâ€ to get a haircut! Need a new dress for an event – borrow one from a friend. I am new to this site. Very excited to jump on board. One thing I have done to save money as we have transitioned to greener living is to make my own cleaners and go with reusable items like rags instead of a paper towels. Never buy new kids clothes! There are plenty of resale shops, garage sales and craigslist to find nice stuff, sometimes new, for kids. My favorite money saving tip: Decide that cash is a super boring form of currency and try and get as many of the things you need through a barter economy. People will do insane things for homemade jam and cookies from a good neighbor. I write down everything I spend – it helps me know where my money is going! One money saving tip I have is not driving. Every year I take the insurance off of our vehicle and we walk, take transit or bike ride. Another tip is to incorporate more veggies and legumes into your grocery shopping list, and less meat. I’ve saved a lot of money doing this. My favourite money saving tip is… I seem to shop at a lot of independent stores that have different sales days each month, whether it’s 10% off every first Sunday or 20% on Wednesday evenings, those kind of promotions. When I receive a Facebook message or email letting me know when these promotions are I put a small reminder on my calendar. Then when that day comes around, I pull out my shopping list that I regularly update and see if any of the items on there come from those stores. That way, I’m not really buying anything that I wouldn’t have bought before, I’m just saving on the products that I already buy (plus, I don’t have an inbox cluttered full of emails that I know I want to save because there’s “something about a sale” but I never really get around to looking at). Saving money? cutting up the credit cards has been the best thing I’ve ever done…scary at first, but so worth it in the long run! My tip is: don’t leave the house. 🙂 it’s a lot harder to be tempted to shop or swing by a fast-food place if you’re happily at home. I enjoy free entertainment by attending gallery openings & volunteering to usher at local theaters. I see wonderful art/performances, socialize, & sometimes even eat enough appetizers to forego dinner! I track all of my spending, and seeing it laid out by category really helps me keep a handle on where I spend my money. I also rarely buy anything new. Comparison shopping and a price book! Its not the most exciting money saving tip, but it definitely saves me a ton of money. After the initial work in compiling the price book I can take a quick look at a few sale fliers and see exactly what sales are a good deal and which are not. Best money saving move I’ve made in awhile. My favorite frugal trick is using CraigsList to remodel my old (historic) house. The house also has two apartments with it, that pay the mortgage on all three units. My favorite money saving tip is to get hand-me-down kids clothes from friends, then pass them along to other friends. Most of my son’s clothes get worn by 4 kids before they wear out! My best tip, rather my solution to impulsive buys… is “Buy it”! Then in next trip return it back to the store. This way I am happy that day for the new buy..and when I am back home and realize it was an impulsive choice (back in my senses again 🙂 )… return it back… I just get the “shopping happiness boost” for free …and then follows the “frugal happiness boost” when I get the refund back.. I know a friend who is even a step smarter. She is a shopaholic; but good news is she “knows” she is one. So she keeps all dresses she bought in her car .. and the next time she is in the same store, she looks for the same stuff ..if its cheaper(like 5-10$ less), she returns it and buys it again, saving the price difference! An added benefit, she lost a ton of weight with this obsession … shopping is drains energy after all! I think going the cash only route and having a monthly budget is the best way to control money. Staying out of the stores works best for me. Sometimes I give one of my sons cash and a list and let him walk to the store so that I am not tempted. If he wants something not on the list, he uses his money. Track track track spending- hold ourselves responsible for choices! At the end of every calendar quarter, skip a week of grocery buying. It’s a great way to save on the food budget and use up stuff that’s been overlooked. 1. Really limit eating out. We eat out for special occasions only: maybe 3 or 4 times a year. This way, we keep it special, we save on calories and fat and other unhealthy things in restaurant food, and we avoid the money drain that restaurants are. 2. Line-dry clothes 12 months a year. I live in Vermont, so we have cold and snowy winters. In the summer I dry my clothes outside on the line, and in the winter I use a wooden rack in front of my woodstove. I think I only used my dryer once in the last year, in a damp hot week in the summer, when there was no way the clothes would dry either inside or outside due to the high humidity. This save a lot of energy, since dryers are energy hogs. Plus my clothes get that nice air-dried smell. Don’t buy what you don’t need- if it’s free or ridiculously cheap find someone else to give it to. If you don’t buy things, you aren’t spending money, period. My local co-op has bulk shampoo and conditioner. I bring in my 16 oz plastic shampoo bottle and 8 oz plastic conditioner bottle and fill up for about $6 for both combined!! !